Thinking like a buyer is the key to selling your home. Thinking about selling your home? Start thinking like a buyer. If you were in the market for a house, would you be willing to pay top dollar for where you live now? Big-ticket items tend to be high on a buyer’s list of deal breakers. Some homebuyers, like many Millennials (who make up the majority of homebuyers today), have limited budgets. These buyers aren’t interested in making major investments right after purchasing a new home. While some might be okay tackling minor projects on their own time, there are some fixes that today’s buyers aren’t willing to add to their to-do list — and a roof replacement is at the top of that list. Roofing leaks, missing or damaged shingles or improperly working gutters and drainage are all concerns to a potential buyer. New roofs are worth every penny, but they’re still a big investment. A home inspector can help you determine the condition of your roof before the buyer brings their own (and they most likely will!). In fact, REALTOR Magazine lists a roof as having the greatest remodeling value. It can bring more than 100 percent of the money spent back to the seller, is high on the list of renovations that have greatest buyer appeal, and it’s at the top of the list in terms of homeowner satisfaction. When you think like a buyer, you take every possible element of the house into account. 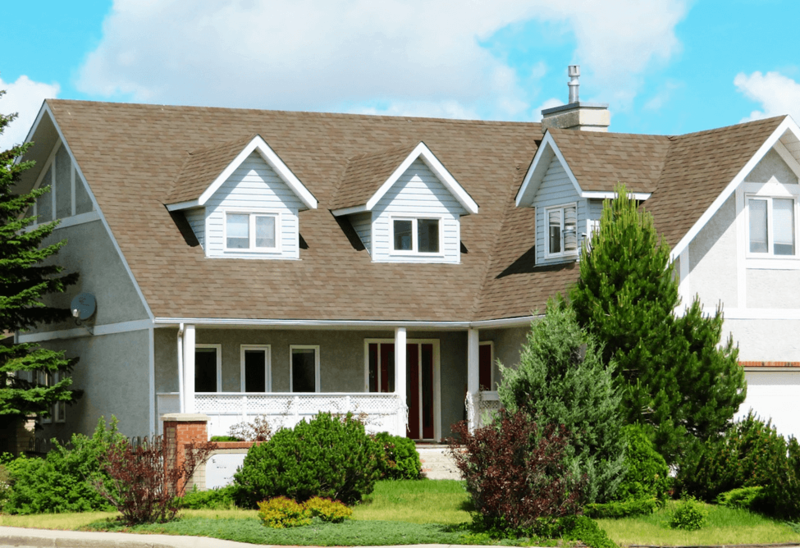 When it comes to the roof, there are three main factors that a prospective buyer will consider. If you were a buyer pulling up to your house, would you be seeing red—literally and figuratively? The red shingles on a red brick house look is out. Complementing colors are favored over a monotone look. A new roof with dimensional asphalt shingles can give your home the instant facelift it needs to really pack a punch from the curb. With more colors and styles to choose from than ever before, there’s an asphalt shingle that will add the right look to your home. Double and triple laminate luxury shingles can even look like real cedar shakes or slate, adding a high-end look that can set your home apart from the competition. A properly vented roof does a lot for your roof and your home. It keeps your attic space cool and extends the life of your shingles. When your attic is cool, your home stays more comfortable, too. Proper ventilation can even help reduce energy costs—a primary consideration for many buyers as energy costs rise. Some realtors are seeing buyers show more interest in homes that are energy efficient, with energy efficient upgrades being a point of price negotiation if they haven’t already been incorporated into the home. A new, properly vented roof system may help entice new buyers who are concerned about systems and energy efficiency in an older home. Warranties are very appealing to home buyers. Put yourself in their shoes—do you want to have to do unexpected repairs on a home you just bought? Maybe you’ve considered adding a home warranty to entice buyers looking at your older home. Since most home warranties don’t cover pre-existing conditions, problems with a faulty roof won’t be covered, and seasoned buyers will know this. When you purchase a new whole roof system, that roof will come with its own warranty. Many homeowners learn the hard way that most roof warranties only cover the cost of materials. But, companies like Long Roofing offer transferrable lifetime warranties that cover labor as well. Think like a buyer…how great would it be if you knew you’d never have to worry about any part of your roof as long as you own your home? The key is to think like a buyer. That means that a roof replacement might be in your best interest. Let us help you sell your home. Learn more about Long Roofing and the Integrity Roof System® today. Ready for a roof replacement? Call us today at (800) 417-5664 or visit us online for more information.